Sixth generation cattle rancher and former Chief Justice of the Florida Supreme Court, Jim Alderman (Okeechobee), says his great grandfather, Streaty Parker migrated from North Carolina. At Fort Meade, he led the “Hickory Boys” to stop cattle rustling. Gene Crosby, Cattle Manager of the Deseret Ranch was raised in Holopaw, a former timber town. When the industry went under, his daddy got a job at the Deseret Ranch where Crosby grew up. 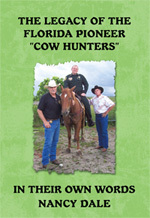 These are true stories of struggle, survival, courage, fortitude and foresight as told by the pioneer “cow hunters” in their own words.